After decades of regional, national, academic and civil society attention, the haze problem is as intractable as ever. Recent efforts to combat haze have been far from cursory. The source country Indonesia has enacted logging moratoria, combined its environmental and forestry ministries, and ratified - albeit with great delay - the Asean Agreement on Transboundary Haze Pollution in September last year. It has improved its land concession maps, expanded programmes on community-based forest management and fire prevention, levied a fine of over US$25 million (S$37 million) on an offending palm oil producer, and recently arrested executives of companies allegedly behind the current fires. Singapore has commissioned studies on haze reduction, pursued tangible cooperation with nearby Indonesian provinces, and passed legislation holding offending companies culpable. Large private sector players have recognised the reputational risks they face from the haze, and dedicated greater resources towards eliminating haze-causing activities from their supply chains. Research institutes have improved monitoring and assessment, while civil society organisations have helped build capacities on the ground. Still, the problem pervades the dry months and defies solutions. The primary reasons are threefold. It remains difficult to identify haze-causing culprits even with new legislation, greater enforcement ambitions, and better maps detailing where concessions are situated. Time may improve the effectiveness of these mechanisms but, as the current smoke demonstrates, they are not up to the near-term challenge. First, the forces causing the haze are outpacing efforts to mitigate it. While Indonesia has taken recent steps to combat the fires causing the haze, it has simultaneously advanced its palm oil and pulp and paper sectors as key engines of the wider economy. After surpassing Malaysia as the world's leading producer of palm oil in 2006, Indonesia announced plans to double production and brought millions of new hectares under cultivation. These plantations now cover an area more than twice the size of Singapore and Belgium. Meanwhile demand for paper continues to rise in emerging Asian economies, particularly China, and Indonesian plantations reflect the country's place as a key supplier. Indonesia's pulp and paper industry may expand by 20 per cent between 2014 and 2016, and projects strong longer-term growth. The boom in these sectors has changed their structures and characteristics. Expansion has been defined largely by estate-level land clearance, with blurred lines between corporate firms and the small-scale landowners they often contract out to. There is also a growing presence of mid-sized actors that develop plantations but have scant or non-existent public profiles. These actors gain official and unofficial concessions from local governments, whose leaders seek capital for their budgets, their campaigns, and on some occasions, their wallets. Haze does not present the same reputational risks to these mid-level operatives as it does to large corporations like Nestle and Golden Agri-Resources - both of which have implemented haze prevention policies. Second, the source areas of the haze are getting hotter and drier. Burning remains an attractive method for land clearing because it is quick and efficient, requires minimal labour, enriches soils, and acts as a default strategy in lieu of affordable alternatives. In years like 2015 with a strong El Nino warming trend, fires often become large and difficult to control. In carbon-rich peatlands, these fires can burn for weeks and spread far beyond their areas of origin, which in turn problematises efforts to establish culpability. With climate change projections predicting warming trends and drier months in equatorial South-east Asia, these problems may well become more acute. Third, the redoubled effort to combat the haze are relatively new and will take time to be effective. Indonesia's levying of fines and arresting of executives send important signals, but the legal processes surrounding these efforts take years and do not appreciably change the short-term conditions on the ground in Indonesian plantations. It remains difficult to identify haze-causing culprits even with new legislation, greater enforcement ambitions, and better maps detailing where concessions are situated. Time may improve the effectiveness of these mechanisms but, as the current smoke demonstrates, they are not up to the near-term challenge. Despite these limitations, continued regional cooperation on the haze issue is imperative, without viable alternatives. 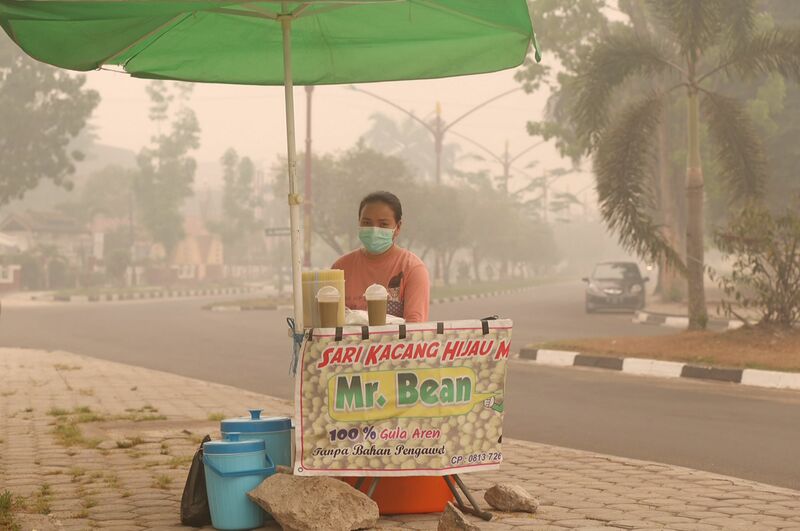 Affected Indonesian citizens suffer even more painfully than their neighbours during acute haze episodes, and hope for solutions as much as anyone. Such solutions are taking shape, but better outcomes may be years in the offing. Such is often the case with transboundary environmental challenges, which leave impacted countries vulnerable to effects that they cannot prevent through their own action. These countries are left to respond to the environmental stress that they inherit at home, while trying to stimulate changes in neighbouring territories. Singapore is on such a trajectory, but, as Euston Quah and Tan Tsiat Siong recently wrote in The Straits Times, Singaporeans will likely be asked to "accept that the haze will be with us for years to come, and learn to live with it while mitigation efforts are ongoing". This assessment seems likely to bear out, as near-term solutions remain difficult. •Jackson Ewing is Director of Asian Sustainability, Asia Society Policy Institute in New York and an Adjunct Fellow at the S. Rajaratnam School of International Studies (RSIS), Nanyang Technological University. •This article first appeared in RSIS Commentary.